Note: Minecraft is still currently in its Beta stage. A full and complete review will be made upon the game's final release on November 11, 2011. Please note that there is a discount on the game while it's still in its Beta stage. As far as I can remember I've spent countless hours over the past 5 months toiling away with the world of Minecraft, and I still manage to find new stuff to do. 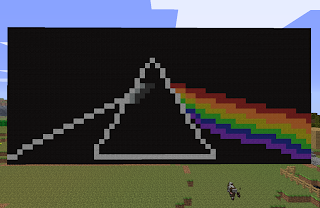 I've built a fortress in the sky, a castle with a huge mine, a railway system, the cover of Pink Floyd's "Dark Side of the Moon " and even an Egyptian pyramid. I've played around with the Bordercraft texture pack, created various circuits (with the help of Minecraft Wiki of course), had fun blowing random things up with A LOT of TNT thanks to inventory editors, and even installed the flying mod to make creating pixel art easier. If I ever find something missing from the game, it's added in a few updates. Maps, for example were something I wanted to emulate the discovery aspects of The Legend of Zelda: Phantom Hourglass . Lo' and behold, Maps got added into the game with update 1.6. 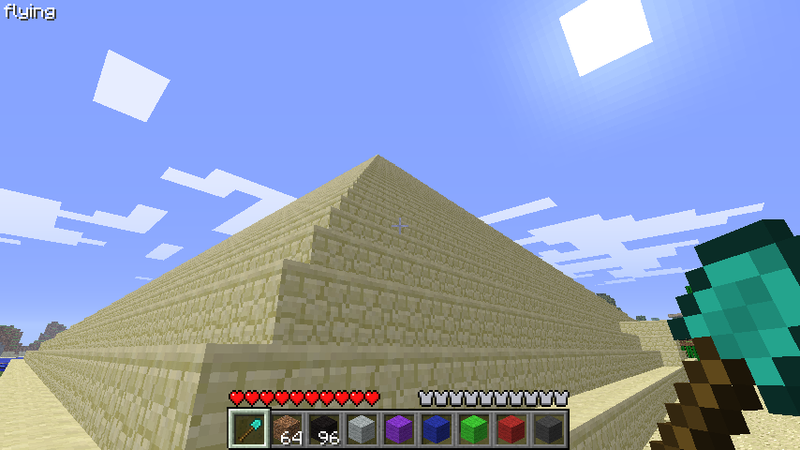 A few issues however, still remain with Minecraft as it exists in its current state. The game has an overwhelming sense of loneliness as you are the only human or humanoid that isn't a Zombie, Skeleton, or other agressive mobs. Notch (the creator of Minecraft) has said that he will be adding Pigmen and Pigmen villages in a future update. Perhaps we will be able to go Anakin Skywalker on them or, if we so choose, make some sort of peace offering. Only time will tell. Though, a few other things still annoy me, especially when playing Survival Multiplayer. There currently exists no way for you as a player to designate a certain spot that you built as your home (using the default server software). There exist server mods that, for example allow you to place a sign in front of your door with a header tag that will automatically make the door (or any chests you put the sign in front of) openable by only you. However, a determined griefer will not bother using a door, they'll merely dig under or through the side of your house to get inside if they are so determined. This can become a huge issue if you play on a small server where as far as you know a griefer can be breaking into your home while you're asleep or even out adventuring the land, looking for iron, or coal, or sugar cane, etc. It's like moving to a city with at least some criminal activity and leaving your door locked while your house is made out of straw. It's never fun when you're the little pig with crappy building material and you have to constantly watch out or repair your home. Another issue I find in SMP is the fact that there is no economy for you to sell goods at a reasonable trade. Yes, there do exist server mods that list suggested prices and you could always be vigilant as you would when selling things in reality, but there should be some sort of menu where you can at least compare items to trade and finalize the trade without running the risk that the person you just gave 64 gold ingots to will run off and never give you the 48 blocks of obsidian you "agreed" upon. Single player also suffers this issue, in which everything you own is essentially worthless. If you had a hard time finding diamonds in Single Player, there's no way for you to trade for them. You either find diamonds or hack them into your inventory or you simply don't use diamond. Minecraft certainly has come a long way since it was first released for pre-sale and testing. It has even come a long way since I started playing it in January. The game has increasingly grown in quality, playability and fun. Notch has also said that there will be other modes to play when the game is released, such as Capture the Flag and Adventure Mode, coming in update 1.7 as a dungeon crawling adventure where the dungeons are, like everything else in Minecraft, randomly generated. As it stands, I cannot give a full review score to an unfinished, unreleased game. I can, however recommend the game for you all to play and try out. Playing the original Minecraft (now called Minecraft Classic) is completely free and you can do so on the Minecraft website. I look forward to what else awaits me in the world of Minecraft, and get so eager to see what has been added with every new update.